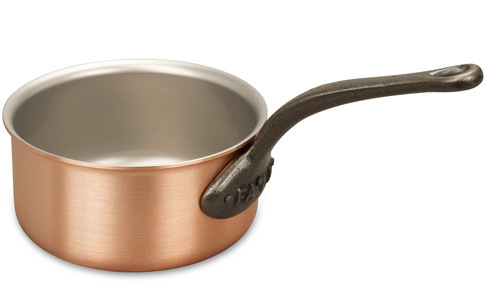 We know you'll love this	16cm copper saucepan	as much as we do. Very nice all-rounder Very nice medium sized saucepan, though not quite as tall as most 16cm pans. Heats very nicely and evenly, and the interior means prctically no sticking. 1105 customers found this review helpful. Did you? Yes, I did! 1104 customers found this review helpful. Did you? Yes, I did! Wonderful Pans These pans are wonderful, I cannot speak more highly of their robust nature and their heat conductivity. Ideal for the Everhot type of cooker. 1100 customers found this review helpful. Did you? Yes, I did! The small size counts While baking n cooking, a small great quality saucepan is indispensable. I just had to have it. Ideal pan for smaller quantities Comes to temperature very quickly with good heat control using only a small burner. Excellent for everyday use now that the children have departed and we need much less food for our main meal. 1039 customers found this review helpful. Did you? Yes, I did! Small, but powerful and useful! It's a small pan, but powerful and useful! I have used it quite often since 2 weeks ago I got it. This pan is good at making small amount soup and sauce, boiling beans and corn(grain), braising and even sauteing small size food! It is a very nice falk saucepan! Christmas 2013 Excellent service and wonderful products. So stylish. A wee baby of a pan This is a little 'un but, truth be told, it's probably one of the most used pans I have. Great for heating small amounts of stuff - no point heating water just for the sake of it! Surprisingly heavy, then again, all Falk utensils are! nice small size I actually use this size the most in my household for boiling pasta or veggies for my toddlers. Even when cooking for the adults, it's perfect for 2 people as a side dish. I have a hot water dispenser, and with this pot, the water is almost instantly boiling. Saves time , gas, and money!! Fabulous Saucepan I've waited a long time for this saucepan and its fabulous, heavy but fabulous. Falk service What a great series of products, the saucepans have added spice to our kitchen not just in cooking but also as decoration when not in use. Despite my remote location, the service provided by Neil and his team was fantastic, nothing was a hassle and all correspondance was clear and timely. Excellent Pan Bought a range of Falk saucepans and have been delighted with the performance. Beautiful, easy to clean and quick to heat. Perfect. Copper saucepan A beautiful saucepan in every way. Easy to keep clean, and I am happy with the brownish patina unpolished copper develops. The good heat distribution lets you brown things well on high heat with reduced risk of burning or sticking, and is also good for thickening custard without curdling on low heat. Can be heavy in the hand, and cast iron handles get rather hot, this is because they are thicker than say stainless steel. 834 customers found this review helpful. Did you? Yes, I did! 16cm saucepan Great for my sauces,and it does not stick.